Multipot + - surprisingly enlightened! A hybrid object; a multifunctional table lamp, a pleasant light! 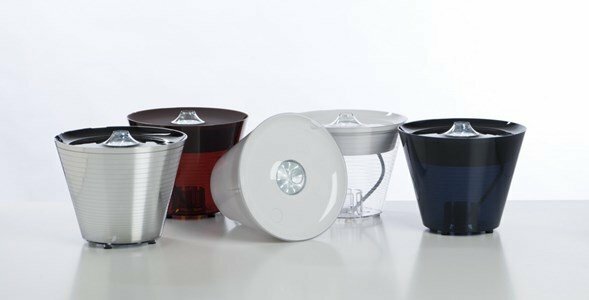 Multipot uses LED techonolgy to light up and has a vase shape where several electric wires fit in. Use it to store and hide the ugly and bothering wires of the phones, iPods, MP3 or digital cameras transformers. These stay hidden inside the vase but ready to be used. It allows to charge batteries of the several different objects of the entire family. The lid is made of coloured, injection-moulded polycarbonate plastic multi-outlet. The vases are injection moulded transparent or coloured polycarbonate vase. Injection moulded transparent or coloured polycarbonate vase. 3-way multisocket and 4 UBS ports. LED lamp with bi-directional light flow and on/off switch.